The whole business of building muscle is a complex process. There's the seemingly endless lifting of weights, the shedding of fat and the shovelling of fuel into your hungry gob to aid recovery and repair shredded fibres. Protein is an essential factor here, and that's where the best protein bars come in. Yummy. Josh Dyson, a performance nutritionist at the Manchester Institute of Health & Performance (MIHP), says that those looking to bulk up should intake around 500kcal above the 'maintenance' level of calories, which is 2,500kcal for your average-sized bloke. So that's 3,000 in total. Admittedly, smashing 3,000kcal into your body isn't exactly difficult – just visit Gregg's – but getting a healthy balance of nutrients (protein, fats, carbohydrates and vitamins) is tricky. On top of this, it's essential that enough protein is ingested on a daily basis, especially if you are hitting the gym hard in search of more defined muscles. James states that a rough guide sees between 1.6-2.2g of protein per kg of body mass. "This can be extended to roughly 3g of protein per kg of body mass for those working stupidly hard in the gym," he says. So, your average male will require around 20-40g of protein per snack or meal, depending upon an individual’s body mass, which is fine if you have unlimited access to cooked chicken breasts but can be difficult for time-strapped individuals. Protein shakes are a popular source of the nutrient, as they are quick to make up and guzzle on the go but sometimes it's favourable to have a proper snack to chew, rather than constantly relying on a liquid lunch. Thankfully, the protein producers of this world have cottoned on to this fact and now serve up a bunch of tasty snacks, typically in the form of a bar, that cram in a load of protein and taste good. If you want to really keep track of your nutritional goals, we recommend downloading something like My Fitness Pal, which allows for every meal and snack to be inputted into an app. You will need to be extremely focussed to maintain this but hey – you're a focussed guy! My Fitness Pal is also an easy way of uncovering abnormally high sugar or saturated fat content in these packaged sweet treats, as it's possible to simply scan the barcode of most products to reveal the nutritional information. This saves you the bother of, you know, reading it. As with any pre-packaged food today, it pays to flip that sucker over and check its nutritional information. Despite being sold as healthy alternatives, some of these protein bars contain a lot of sugar and saturated fats, which is not great if you're looking to get ripped. Your choice of snack should be based on the amount of protein that's packed into each bar, with a consideration taken to low sugar and saturated fat content, as well as a healthy balance of carbs. On top of this, it's worth scanning the ingredients list to make sure it is not packed with chemical flavour enhancers, emulsifiers, E-numbers and other nasties. Eating naturally is always the best option; so mixing one or two of these bars with a handful of nuts, fruit and other great sources of protein throughout the day is the best way to ensure the body receives all the nutrients it needs. 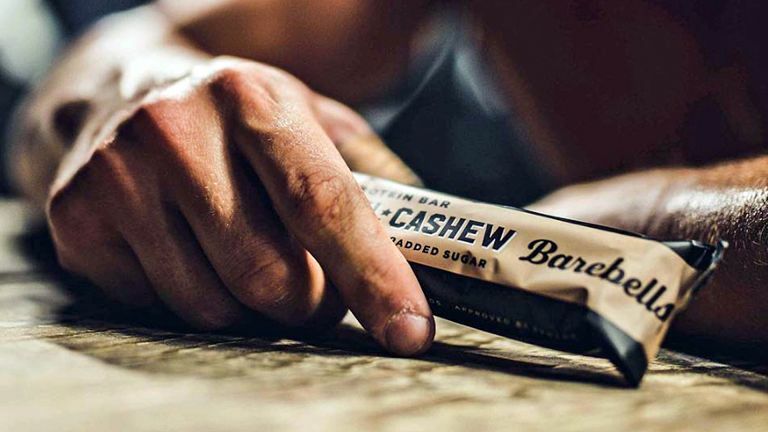 In our humble opinion, the best balance of taste, low sugar and fat content, minimal calories and high protein content can be found in the range of bars from Barebells. The white chocolate almond and salty peanut flavour snack bars are difficult to discern from the sort of naughty chocolate bar you'd be tempted to grab at a petrol station, but pack 20g of protein, just 1.5g of sugar and 4.4g of fat into each 55g bar. If you've got a sweet tooth, these puppies are a great alternative to gorging on traditional chocolate bars and nicely kill a craving without derailing the weekly nutritional regime. They are pricey, though, so if you simply want to quickly quaff some protein, it could be worth turning towards some traditional protein powder. All of this talk of sweet stuff is enough to have the stomach flipping, but for those that crave the savoury, there is very little to compare to some good old red meat (sorry vegetarians). The guys at The Curators aim to make beef jerky more palatable with flavours like Sweet Sriracha and Teriyaki Spice and we can reveal that they have most definitely succeeded. This is very tasty stuff. Perhaps more importantly, a small 30g bag of cured meat contains a whopping 11g of protein and just 1.5g of fat. Despite the tasty flavour, there's also a surprisingly low sugar and salt content too. Winner. You may have seen these guys on Dragon's Den, where they power walked into the room and jogged away shortly afterwards with a sizeable investment from Peter Jones. Deborah Meaden may have had a few choice words to say about the branding but never mind that, as these things are delicious.There's a sizeable hit of protein in them too and the rest of the range is also well worth checking out. Those who want to completely ignore the sugar should probably look away now, but Oetein bars are among the tastiest on sale at the moment and do a good job of mimicking the proper filthy, protein-deprived flapjacks you'd end up regretting after stuffing them in your face. The protein content in these tasty Beachbars may not be as high as some of the others on this list but each bar contains just 151kcal, which is great for anyone looking to sneak in a quick treat without piling on the pounds. Available in either Chocolate Cherry Almond or Peanut Butter Chocolate, both flavours taste extremely authentic, while the recipe feels nice and light, as opposed to some of the more filling products reviewed here. It's worth noting the fact that each bar contains 6g of sugar, especially if you are partial to sweet things, while 7g of fat can seem like a bit much for 10g of protein. If hunger cravings are proving a problem, it's easy to fend them off with these dense flapjacks. Unlike the flapjack your momma used to make, this one keeps sugar down to a fairly appropriate 11g, while protein is a healthy 15g per bar. However, saturated fat content hovers around the 5.6g mark, which, remarkably, is slightly more than a Snickers. These are very tasty though, and the Chocolate Caramel flavour does a great job of mimicking those tasty but very unhealthy 99p offerings found in most corner shops. Granted, there are healthier ways of cramming 15g of protein into your body but this sweet treat stops the stomach rumbling and contains half the sugar of your typical chocolate bar. Where a number of bars featured on this list cut a few corners in terms of natural ingredients, the Primal Pantry tries to stick to all-natural ingredients with the likes of dates, goji berries, raspberries, almonds, hemp and sunflower seeds all condensed into bar format. Its mixed berry protein bar crams 15g of natural protein into the tasty snack, which tastes exactly as you would imagine a bunch of squashed berries to taste. The high fruit content means that the resulting sugar figure is a bit shocking (22g), while carbohydrates are also pretty prominent, but this makes it a great snack to wolf down just before a punishing workout for the energy benefits. A recent study by Kingston University found that the epicatechin found in dark chocolate could increase the nitric oxide production in the body and therefore give athletes a competitive edge. This 85 per cent cacao dark chocolate bar not only packs the dark chocolate benefits, it is also enriched with 19g of protein per bar. It's probably not a great idea to gobble down the entire pack before a workout, seeing as there's 37.6g of fat in an 80g bar, but a couple of squares before hitting the gym could help you push it to the next level.